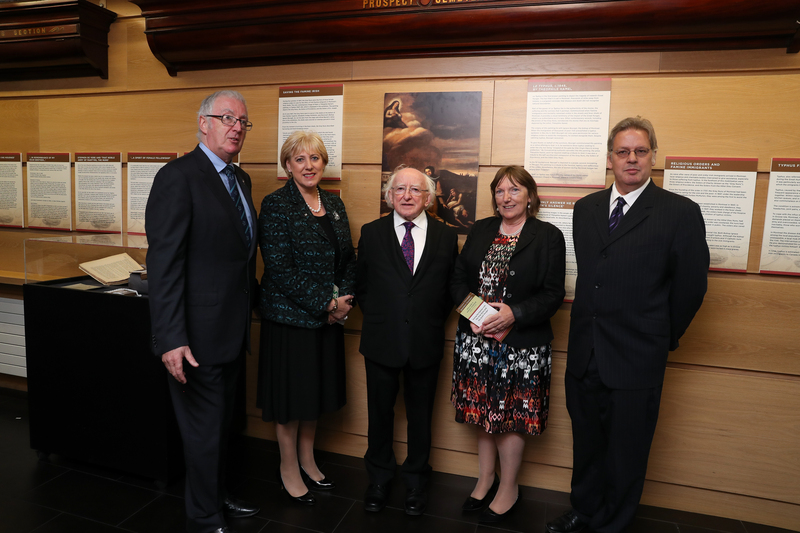 Photo L-R: John Green, Minister Heather Humphreys, President Michael D. Higgins, Professor Christine Kinealy, and Dr Jason King. 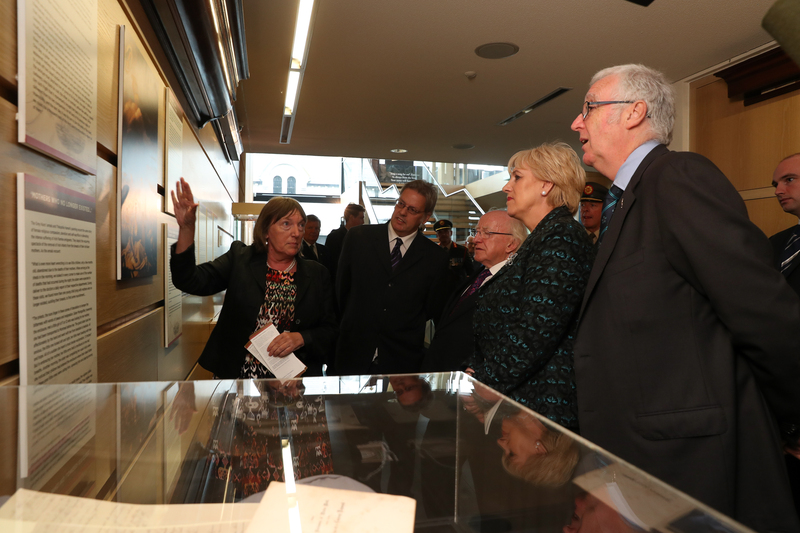 President Michael D. Higgins and Minister for Arts, Heritage, and Regional, Rural and Gaeltacht Affairs Heather Humphreys opened the “Saving the Famine Irish: The Grey Nuns and the Great Hunger” Exhibit at Glasnevin Museum for the National Famine Commemoration on September 11th 2016. 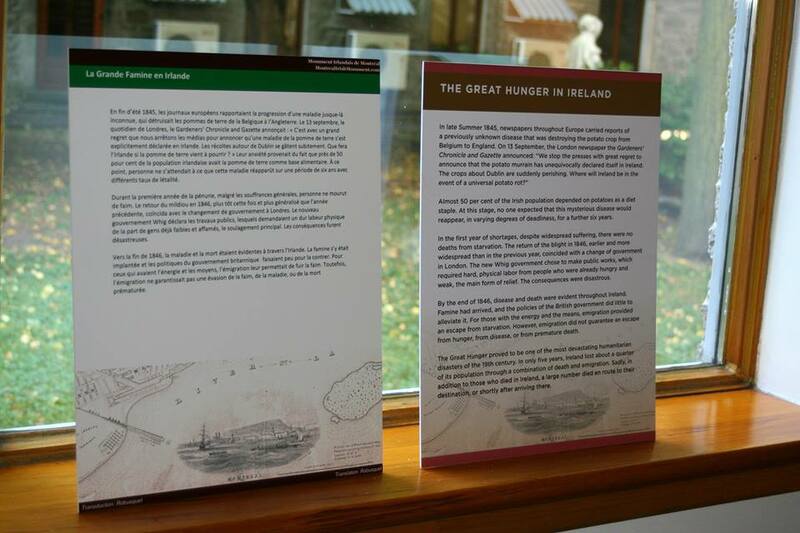 The exhibit is curated by Professor Christine Kinealy, Founding Director of Ireland’s Great Hunger Institute at Quinnipiac University, and Dr Jason King. 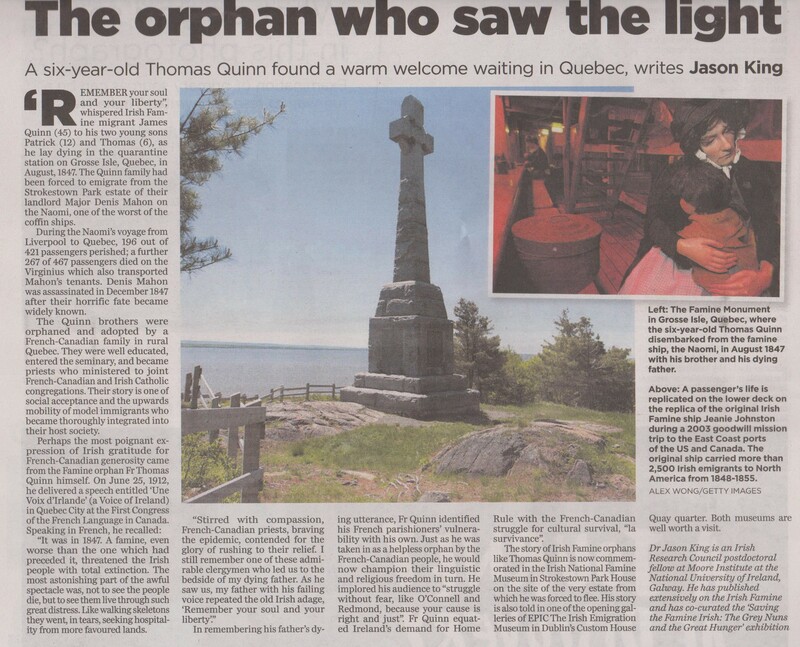 It tells the story of the Grey Nuns who cared for typhus-stricken and dying Irish Famine emigrants in the fever sheds of Montreal during the summer of 1847. During that bleak and terrible period of our history, an estimated one hundred thousand Irish people fled to Canada. It is impossible to imagine the pain, fear, despair, and suffering of these emigrants, many of whom lost beloved family members on their journey. As a country, we owe an enormous debt of gratitude to the Grey Nuns, who cared for so many Irish widows and orphans who were left destitute, impoverished and alone in a strange country. This exhibit is a very important project, which allows us to finally acknowledge the generosity and enormous humanity of those wonderful sisters whose kindness and compassion, during one of the worst moments in our Country’s history, must never be forgotten. Today we will also remember those such as the Grey Nuns of Montreal who are depicted in a new exhibition here in Glasnevin, and who chose to put themselves in harm’s way to treat and aid Famine vicitms. Such people remain the light of the human spirit confronting the darkness, and should not be forgotten. The “Saving the Famine Irish: The Grey Nuns and the Great Hunger” exhibit is open to the public FREE of charge from September 11, 2016. 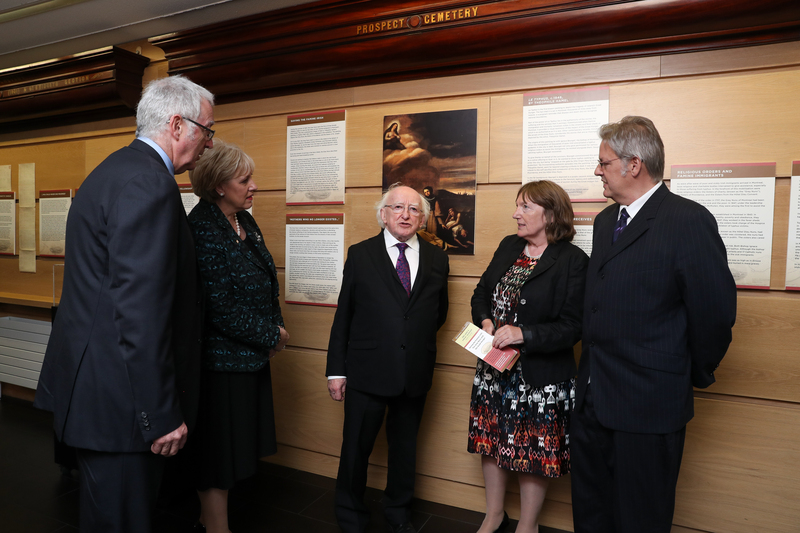 Photo L-R: Minister Heather Humphreys, Dr Jason King, President Michael D. Higgins, and Professor Christine Kinealy. 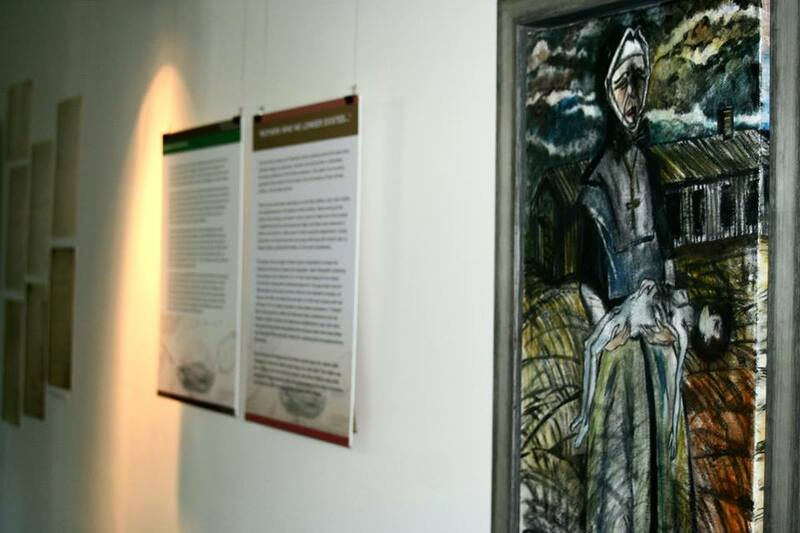 We are very pleased to note that the Grey Nuns exhibition called “Saving the Famine Irish: …The Grey Nuns and the Great Hunger” is now open for viewing at the Grey Nun’s Motherhouse at 138 rue Saint Pierre in Old Montreal. Currently the exhibition can be visited any day between about 10am and 5pm – but an effort is being made to extend, or offer a few evening hours. Even if you saw this exhibit during the few weeks that we had it at the Centaur Theatre, you might want to visit it again. Just the building itself dating back from the 1600”s is beautiful, and our exhibit is only a very small part of their permanent Grey Nuns museum – which, on its own, is fascinating. The “Saving the Famine Irish: The Grey Nuns and the Great Hunger” will be on display until about the end of November – and is running at the same time as one that is on display in Dublin, Ireland – “Grey Nuns Famine Exhibit at Glasnevin Museum in Dublin”. It involves very similar items as will be found at the Dublin one, with the exception that here in Montreal, the display is bilingual; and also includes some terrific paintings about the event by a local artist, Karen Bridgenaw – which were not available when we had it at the Centaur. If you plan to attend with a small group, you might want to contact the Grey Nuns at (514) 842-9411 – and they may be able to arrange for a guide to give you a proper tour on their museum. So if you happen to be in Old Montreal, do take this opportunity to visit this beautiful building and great exhibition. We will update you with any additional information concerning extended hours etc., as it becomes available. Monument at Victoria Park in Cobourg, an area previously known as Corktown, in Ontario. Setting sun at Greater Napanee, Ontario. 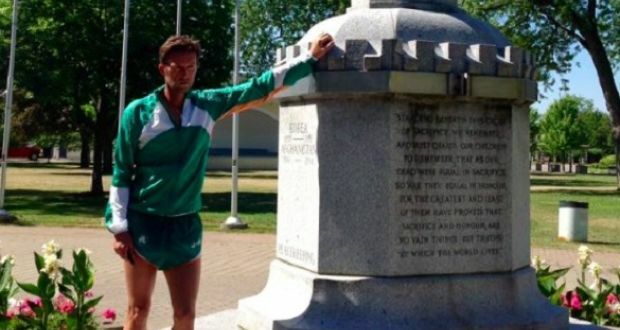 The Irish Diaspora Run sees Michael Collins running almost 900km between June 10th and July 10th, from Grosse Île to Toronto, tracing the steps taken by thousands of Irish immigrants who fled the Famine in 1847. This is the first of his weekly updates for The Irish Times. Having passed the five hundred mile (805km) mark in the last week of my run retracing the route the Irish immigrants of 1847 took along the Saint Lawrence from Grosse Île to Toronto, my understanding of the story of Irish migration to Canada both pre and post 1847 continues to reveal the deep correspondence and influence of numerous immigration waves of Irish to Canada. Much of this emigration throughout the 1800s was spurred by the yearly spectre of continual deprivation and near starvation that stalked the tenant class, especially between the time the potato crop ran out and the harvest of a new crop. Food scarcity was further exacerbated when, between 1800 and 1847, the population of Ireland doubled from four million to just over eight million. The population explosion was most notable in the rural footholds of Munster and Connaught, to which preceding generations had been banished during Cromwell’s reign of terror. By all accounts, catastrophe was inevitable. Tragically, the potato blight of 1845 would prove a tipping point, grimly auguring the unsustainability of a land system controlled by an absentee landlord class, while further highlighting the ineffectuality of British policy that broached a fated providentialism in believing that the hand of God was behind the potato blight. One detects even then a perverse providentialism and unnerving psychopathology behind the satire of raising and selling Irish babies at market, but such was the sprawling poverty of an overcrowded Dublin in the early 18th century. To be sure, the bombastic hyperbole owes much to a stylized Protestant-inspired rhetoric. Yet the underlying appeal for moral restraint tied directly to tenets of the Protestant Reformation, namely, the direct mediation of the self with God, an idea which would eventually dovetail with the secularist Enlightenment ideas of self-determination and individual rights. This hybridisation of spiritual determinism with secularised enlightenment would further influence economic theory as Adam Smith, in his Wealth of Nations, penned a proto-Protestant inspired manifesto that argued for unregulated free markets and laissez-faire capitalism based on rational self-interest and competition. In anticipating a shift from the essentialism of Catholic emphasis on the transcendent and acts directed to God alone toward Protestant self-actualisation in the temporal world, Smith extended Luther’s argument for vocations, so that the agency of exchange between men could align with principles of self-interest while simultaneously serving a moral function in promoting compassion and advancing happiness. In essence, a true Christian could not isolate his relationship with God, speaking only of faith while overlooking his relationship with his neighbour. Tragically, Ireland was worlds away from this emergent neo-Protestant capitalism spreading across Europe. 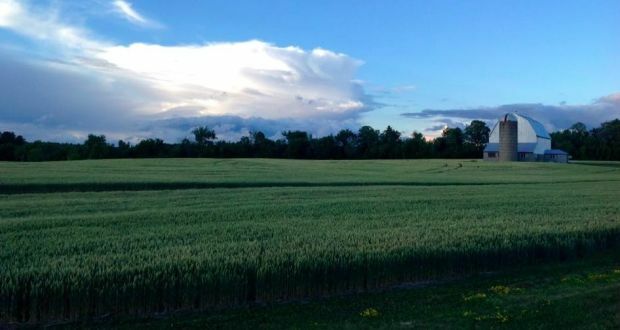 While the creep of Enclosure Acts elsewhere ended a medieval serfdom of tenant farming, reorganising commerce around industrial cities, Ireland was going in the opposite direction. To the casual observer, the country exemplified the antithesis of moral restraint, or it was more politically convenient to conflagrate unremitting birth with Catholicism and Irish ignorance than to seek a deeper understanding of the Irish situation. In effect, the Irish dilemma – for the English parliament – became less about underlying economics and more representative of a sectarian attitudinal divide, as Protestant self-determinism met the miasma of a wretched Catholic helplessness. I have provided the above historical preamble as my own interpretation of the circumstances that led to the marginalisation of the Irish in the decades preceding the potato blight. I undertook the study of the historical influences surrounding the Irish situation for my own understanding of the socio-political history leading up to the failure of the potato in 1845, though, subsequently, with the advent of the run, I offered my own interpretation of historical influences as a point of discussion. I am not a historian, and I understand the pitfalls of advancing theories without extensive research, yet the spirit of the diaspora run has sought to initiate dialogue and draw either support or corrective criticism or encourage competing theories to find voice. Yes, social media can accommodate and promote work of dubious academic rigor, but the general emphasis in embarking on the run and hosting the Irish Diaspora Run Facebook page was to facilitate discussion with the assertion that opinions and oral histories of the descendants of those who left Ireland matter, and that the received history of a people bears on how history is commemorated. In doing research for the run, in speaking with historians, a quiet murmur arose suggesting that, due to political tensions, commemoration of the sesquicentenary anniversary of the Great Famine was perhaps tempered, as the Good Friday Agreement was not yet signed. Indeed, in 1996, while in Australia, Fine Gael minister Avril Doyle, during a speech marking the Great Famine, cautioned that “Irish people needed to develop a mature relationship with their past, to view the famine as a moment in history which defined a sense of vulnerability and not as a weapon for modern political conflict”. As late as 2013, the eminent historian Tim Pat Coogan, in his The Famine Plot, caused a furore in academic circles by arguing that the famine was genocide perpetrated by the British. Challenging Coogan’s scholarship in a particularly vitriolic exchange, Liam Kennedy, emeritus professor of Economic History at Queen’s University Belfast, accused Coogan of “providing junk food for the wilder reaches of Irish America”. What I can say so far, in hosting the Irish Diaspora Run 2016 Facebook page, is that the hunger to commemorate the immigration of so many Irish to Canada and America lives not as a point of maudlin sentimentality, but as a point of literal and spiritual departure from one’s origins. The why behind that leaving-taking seemingly matters more to those descendants of that history than it does for those who remained in Ireland. For the Irish diaspora, the leave-taking raises existential and political questions. Indeed, the management of the Diaspora Run page has become a fundamental part of the run. In the three weeks since it inception, with the help of various immigrant groups and selective paid posts to target groups, the page has handled over 100,000 visitors. What has become apparent is that descendants of emigrants, along with a cadre of indigenous Irish, are engaged in an active process of recovering and debating history, facilitated through the democratising role of social media in broadening discourse beyond academic circles. Of course, there are those cautionary voices who will argue that uninformed commentary is potentially harmful, but, in the main, the aggregate of stories and the recovery of lost historical archives by local historical and genealogy societies has facilitated the retracing of the literal migratory path and settlement of immigrants’ waves. In many respects, it is the composite of individual stories, of received history, passed from generation to generation, that best identifies and accommodates our understanding of ourselves as immigrants. 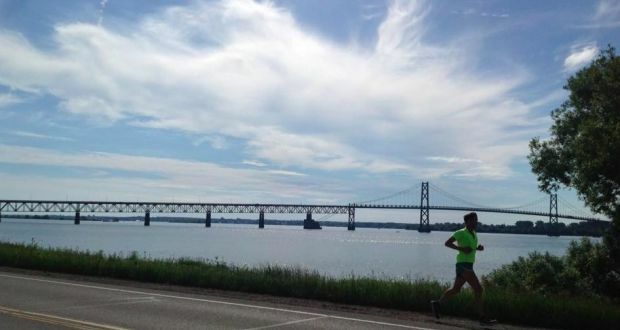 So far, in my month-long run, I’ve attracted the attention of communities along the Saint Lawrence that hold isolated historical records documenting the plight and path of immigrants. 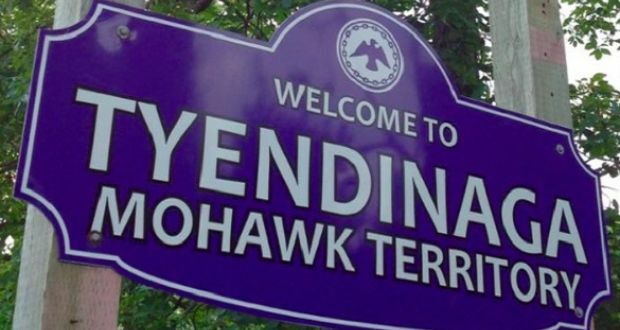 In many instances, the recent recovery of such records has prompted the formation of memorial committees who have independently erected commemorative monuments to this recovered history. This visual testament to a receding history is key to establishing a further awareness and discussion of the socio-political realities that often attend the upheaval of entire peoples. In speaking at Kingston’s Skeleton Park, site of a graveyard to some 10,000 Irish, where the Irish are commemorated with a Celtic Cross, I was made pointedly aware of Kingston’s continued commitment to refugees. The city webpage has a tab – “Refugees” – devoted to helping Kingston’s citizens sponsor Syrian refugees. Of course, in the broadening of dialogue regarding culpability for the death of one million souls and the emigration of another million, I’ve had to negotiate the landmine of historical interpretations. There are those who declare Britain’s inaction as tantamount to genocide, and I’ve been challenged on more than one occasion for steering clear of political controversy. In truth, the sharpness of the exchanges and the pointed criticism is welcome, since part of the process of understanding involves the clash of varying and competing histories. In this receiving and passing of histories, there is always loss and gain. I am mindful of a story I was told in Cornwell, Ontario. 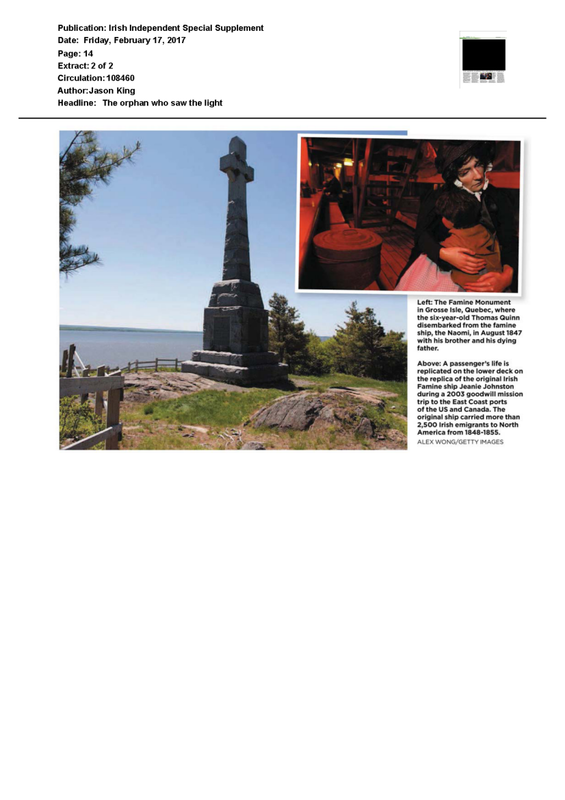 The story concerned an infant Irish child, who, in mortal sickness during the horror of 1847, was passed by her father to a lockmaster on the banks of the Saint Lawrence. The father’s simple entreat was that the child receive a decent burial. The boat passed, and so went the family. The lockmaster took the child as instructed, though, miraculously, under the care of his wife, the child survived and was adopted into the family. Years passed until eventually a letter arrived and circulated in Cornwall from the Irish family, who were then settled in Niagara. Theirs was a simple request – they were seeking information regarding the location of the burial plot of their infant child. The letter went unheeded, the lockmaster and his wife afraid to correspond, the course of the girl’s fate then tied to another history. One can only imagine the tragic void that lived in the heart of that Irish family, and why, for them and their descendants, the matter of leave-taking and the circumstances surrounding their emigration so occupies the diaspora conscience. The route begins at Grosse Île quarantine island, on the St Lawrence river, and continues through Quebec City, Montreal and Kingston before reaching Ireland Park, in Toronto. The project is raising funds for Irish-Canadian organisations seeking to create parks and erect monuments and statues to commemorate 1847. Others can participate by taking on runs where they live, and logging their distances on diasporarun.org, where they can also sponsor Collins. IrishCentral Staff Writers @irishcentral April 20,2016. Montreal Theophile Hamel’s painting “Le Typhus”: The Grey Nuns tending to the Irish at the fever sheds in Montreal. Montreal’s Grey Nuns are being honored, in a touring exhibition, for their charity in caring for and dying with the sick Great Hunger victims in the fever sheds by the St. Lawrence River. In the exhibit entitled “Saving the Famine Irish: The Grey Nuns and the Great Hunger,” which was on show at the Centaur Theatre in Montreal last week, examines the nuns’ heroism and that of other locals. At least seven nuns died and many became severely ill as they nursed the Irish and found homes for the 1,500 orphans. At least 6,000 Irish people lost their lives. When the coffin ships from Ireland began arriving in 1847 there were 50,000 people in Montreal. Over 100,000 Irish, emaciated and often diseased with typhus and other deadly infections, were on their way to Quebec and understandably many Montrealers were afraid. Many wanted the new arrivals pushed into the St. Lawrence River and at one-point Mayor John Mills was forced to deter a mob from doing so. The immigration depot on Grosse Île near Quebec City was unable to handle the deluge of Irish refugees and as many as 5,000 died there. Another 5,000 – at least – died during the crossing from Ireland. Those Irish who survived were quarantined in the 22 fever sheds, built near where Victoria Bridge now stands. Bridget O’Donnel, a victim of Ireland’s Great Hunger, was interviewed by The Illustrated London News in 1849. The Grey Nuns, also known as the Sisters of Charity, were the first order to be called to help the Irish. There were just 40 nuns in the group and most of them became infected with typhus. They carried the sick Irish from the ships to the sheds where they cared for them. At least even Grey Nuns died, but those who recovered from the disease came back and continued to care for those who needed it. There were 1,500 orphans left after the massive number of deaths. The Nuns found them homes either with other Irish families or French Canadians. Also among those caring for the Irish were Catholic and Anglican clergymen, and several priests also lost their lives. There are also tales of British soldiers on security detail at the sheds giving up their rations to feed the Irish. The Nuns’ own writings on the disaster are the “most detailed eye-witness accounts of the suffering,” according to the National University of Ireland, Galway, Famine Archives. Their annals have been digitized, transcribed and translated and can now be read online. Jason King, from the National University of Ireland (NUI) Galway, and Christine Kinealy, director of Ireland’s Great Hunger Institute at Quinnipiac University in Connecticut, put together a portrait of these incredible caregivers for the new exhibition. The exhibit has been on show at the Great Hunger Museum in Hamden, CT for a year will and now tour for a short time, beginning with Montreal. 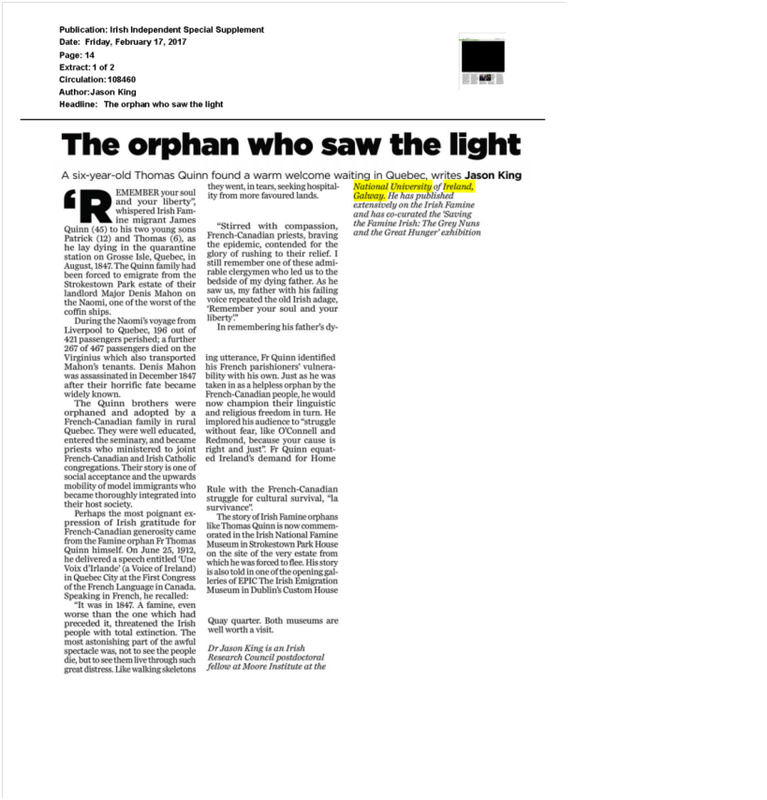 “The story of the Grey Nuns, and of the other religious orders who helped the dying Irish immigrants, is one of kindness, compassion and true charity,” Kinealy said. Fergus Keyes, the Director of the Irish Monument Park Foundation, told the Montreal Gazette, “The exhibit is to concentrate on the people who went to help them, and in many cases gave up their life. It’s hoped that the presence of the exhibition in Montreal will help highlight the campaign to create a park honoring those who lost their lives. Currently the only monument is the “Black Rock” monument, an engraved boulder under Victoria Bridge. Boulder under Victoria Bridge to commemorate those who died during the Great Hunger and construction of the bridge. The escalation of the European migration crisis has led to frequent comparisons in media coverage, political opinion, and public debate between the Irish Famine Migration of 1847 and the perils refugees face today. 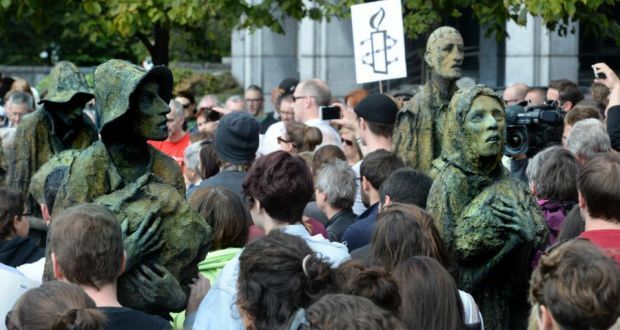 The Rowan Gillespie Famine monuments in Dublin and in Ireland Park, Toronto, have become focal points for demonstrations of solidarity with refugees through the prism of Famine Irish memory. 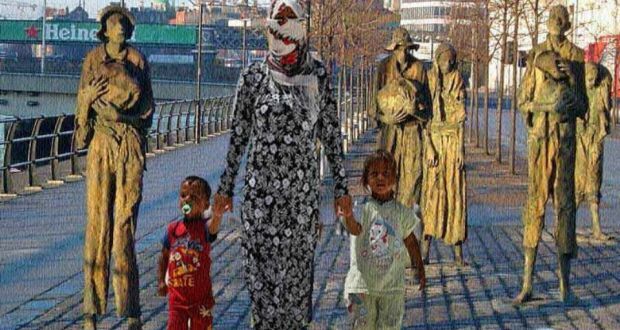 Image of three asylum seekers imposed on a photograph of the famine memorial on Custom House Quay in Dublin. “Let Then In”, Michael Enright. (CBC The Sunday Edition, September 13, 2015). On a sun-blasted morning last week, I biked down to the lake’s edge and sat for a long time in a small, almost hidden parkette called Ireland Park. Out on Lake Ontario, small boats, kayaks, yachts, ferries competed for space on the broad calm waters. No dinghies over-jammed with children and mothers and old men. At the Toronto Island Airport, planes took off and landed, their passengers not stateless, not homeless, no doubt all suitably credentialed. Five bronze sculptures of figures in rags stand in a corner of the park. Their eyes are raised to the great spires and comforting money towers of the downtown. One of the figures lies dead or dying on the ground. The female figure clutches her pregnant belly. The figures are beyond gaunt; they are skeletal. The park was designed by Toronto Architect Jonathan Kearns, himself an Irish immigrant. 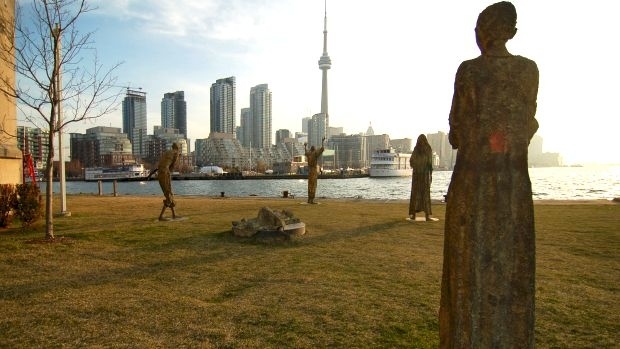 It memorializes the coming to Toronto in 1847 of Irish refugees escaping from the horrific devastation caused country-wide by the potato famine. At the time, Toronto had a population of around 20,000. 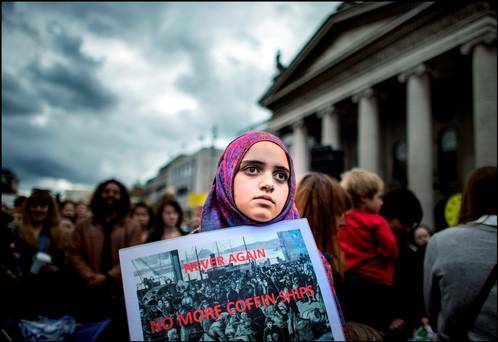 In one year, some 38,000 Irish refugees landed in the city. Hundreds died of typhus in the so-called coffin sheds not far from this building. And still more came, over the next decades. At the other end of the park are 14 very tall towers made of black Kilkenny limestone. On this morning the limestone was warm to the touch. Carved into the interstices between the towers, are the names of some of those who came: Rose Cassady, Luke McCue, James Murphy, Mary O’Brien, Martin Carlow, Biddy Clary, Mary Ryan. Canada has a long and storied history of taking in those Frantz Fanon called “the wretched of the earth.” Irish, Vietnamese, Hungarians, Tamils, Bengalis Guatemalans, Turks, even thousands of political refugees from the United States. It’s what we do. It’s not a bad record but not without some failures, some historical blemishes. We failed huge numbers of Jewish refugees in the days prior to World War Two, by shutting our doors to them. Our policy was none is too many. We turned away a boatload of Sikhs in the early 1900s and we excluded Chinese except as stoop labourers. Nevertheless, in number and behaviour, the refugees we have admitted have never been anything other than assets to this country. The vision of thousands of refugees coming to Canada may upset many people, but that’s all right. Change and the challenge of change take awhile to reach a comfort level. There will be that small minority of xenophobes who can’t abide the notion of strangers in their midst. That’s all right too. Yes there are haters in this country as there are in any other place, in any other time. Does it do any good assigning blame for what we haven’t done? Perhaps. Perhaps the election next month will be a punishment yard. The important thing is to do something generous and effective, and to do it now. Why not a pledge to bring in 50,000 Syrian and Iraqi refugees by Christmas, as retired general Rick Hillier has suggested? And another 50,000 by next Canada Day? Not impossible. In 1847, during the Great Famine in Ireland, Toronto was a city of 20,000, and in a period of six months, more than 38,000 refugees fleeing the famine arrived and Toronto mobilized to house them and to treat the sick. 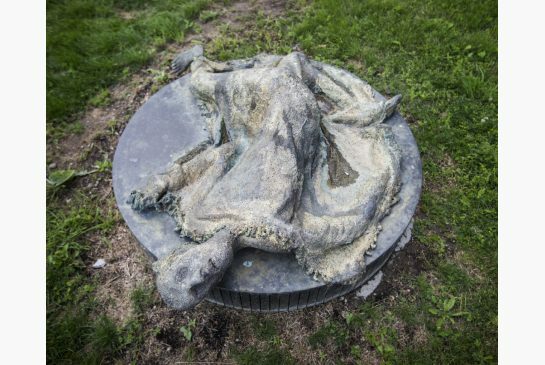 Woman On Ground, one of several sculptures at Ireland Park in Toronto, is dedicated to remind people of the devastation of hunger. In 1847, more than 38,000 Irish Famine refugees landed on the shores of Toronto, causing a major strain of resources.